I made this for my mother, who almost got on with a jar of home-made Seville orange marmalade but was ultimately deterred by the bitterness. Since father was polishing off the first jar, I decided it was only fair to give one to my mother so she could have some marmalade all to herself. 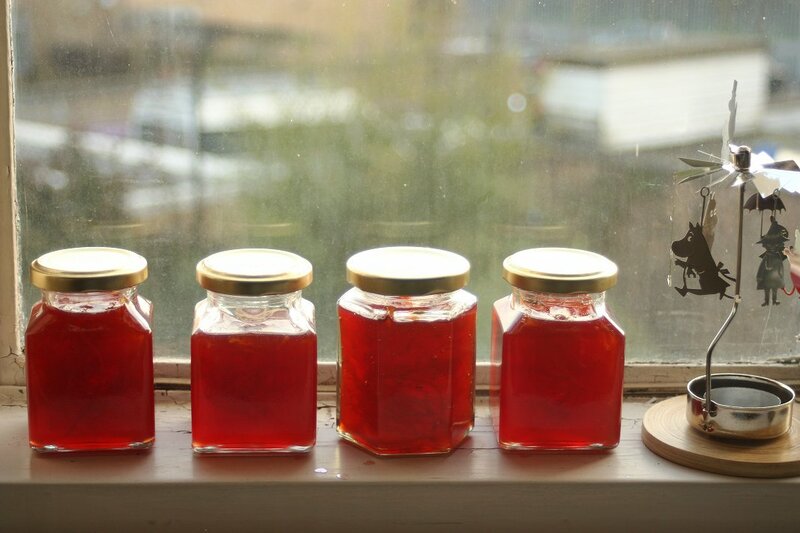 I’m pretty new to the whole preserve-making thing; I’ve made this twice so hopefully it’ll work in other kitchens so you too can get jars of this highly fragrant and very pretty marmalade. That vegetable peeler injured me. Faugh! Lately I’ve been on a blood orange kick. I am ultimately a shallow creature and I love them for their remarkable colours, but I also enjoy the fact that they have a texture that is a little jelly-like compared to the usual navel oranges. They also have a deeper, more rounded orange flavour, with stronger berryish notes on the darker parts of the segments. All things considered, I thought these would be a good choice for an orange marmalade which would neither be excessively bitter nor saccharine, so I set about googling for recipes. Unlike the Seville orange marmalade recipe, there was no clear formula to guide me. I knew that Seville oranges are particularly rich in pectin, especially since you make full use the skin and pith and the dozens of seeds you get per orange, but how do they compare to sweet oranges–or indeed other citrus? Sugar to fruit ratios varied greatly from recipe to recipe with little explanation for these inconsistencies. The very general formula laid out here was a great help, however, and formed a starting point for my recipe. The general sweet orange to sugar proportion is 1:1 but I decided on adding sugar that was equal to 65% of the whole fruit weight, plus a little more so it was a nice rounded number. I know you can make sugar-free jam, but if you do use it, you do need a good bit of the stuff to make sure your jam sets–sugar reacts to the pectin, encouraging the liquid to gel. Sugar also performs an important role in making the food shelf-stable; if there’s too little, bacteria might grow so your food spoils more quickly. I decided to go for a lower sugar content as I was only making a small batch and I knew they’d be eaten soon. Just before simmering the peel. As I promised my mother a marmalade that was not bitter and I had the time to do so, I decided to go for a recipe which included only peel in the final jam. 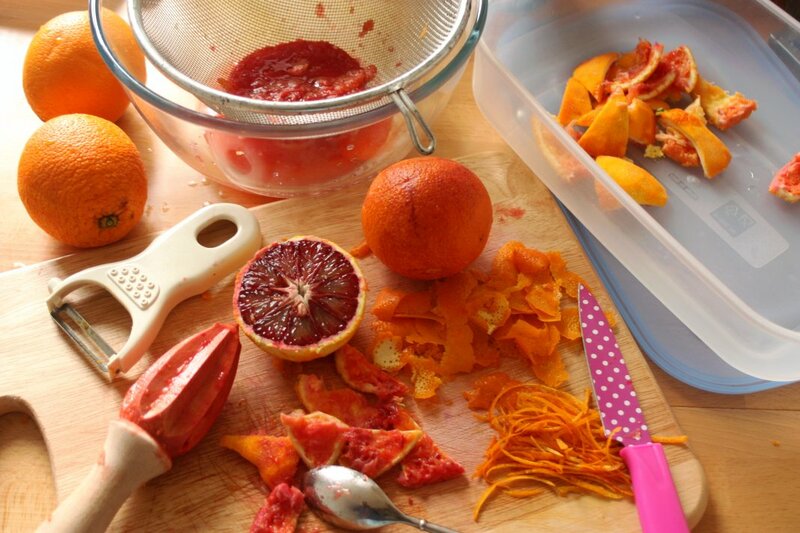 Most of the recipes out there slice up the whole fruit, peel, pith, and flesh; I followed this one, where you juice them, strip off and shred the peel, keeping the pith and seeds in a cloth bag to be simmered to give up their natural pectin and encourage the marmalade to set. I also use fresh lemon juice to help with setting. Although it probably isn’t necessary with such finely cut peel, I leave everything to soak in water overnight as for the Seville orange marmalade because it’s more convenient for my particular workflow and schedule. Preparing the oranges is the most time-consuming active part of the process; other than that, it’s the usual boiling of the jam, sterilising the jars, and potting everything quickly. However you do it, it’s certainly an event! 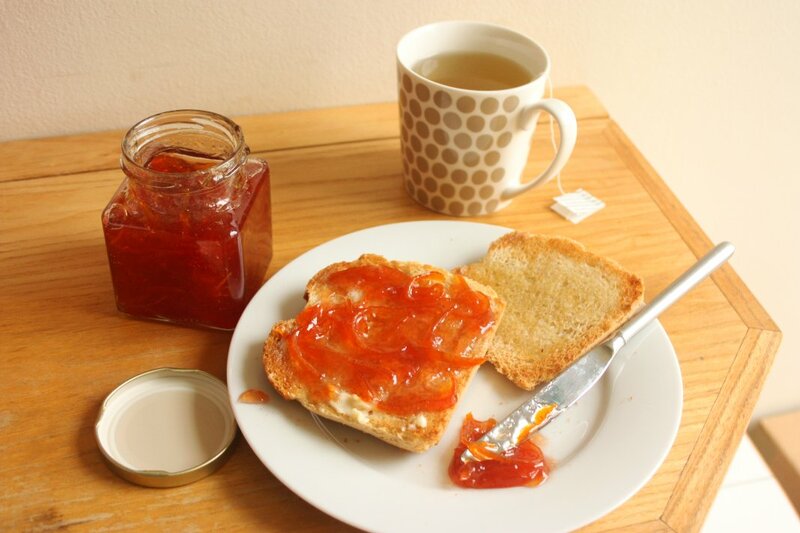 I took my mother her jar of marmalade on Saturday, when we had a spot of tea together. Father snuck tiny spoonfuls of blood orange marmalade from my mother’s toast while she was busy in the kitchen. ‘Pear, this is really nice!’ he said between nibbles. Regardless of compliments, I snitched on him when mother came back and settled in her seat, but she only said, ‘Really? That’s just like him,’ and blithely ate her toast. Use Moro or Sanguinello type oranges if you want a red marmalade; you can sometimes find the former in [cough] Waitrose. It is the only time I go in there, I just feel too plebeian otherwise. Makes a small batch, about 4 x 200g jars. Prepare the oranges. With a very sharp knife, pare off the peel as thinly as you can bear, working from pole to pole. Cut and scrape away as much of the white pith as possible from the pieces of peel. Reserve the pith, leaving it in a large container. Shred the orange peel finely, no wider than 5mm, and set aside in a medium container. Halve and juice the skinned oranges into a sieve set over the bowl of peel. Press the pulp to extract as much liquid as possible. The juice should just cover all of the sliced peel; if not, top up with a little cold water. Add the squeezed orange shells, pulp, and any pips to the container of pith, pouring over cold water to submerge. Cover everything and let them soak overnight at room temperature, or up to 24 hours. The next day, pour the juice and peel into a large saucepan. Lift the shells, pith and seeds out of their liquid and tie them up in a big square of muslin or cheesecloth, adding the bundle to the pan. Pour the soaking liquid into the pan, too, and top up with just enough cold water to submerge most of the bag. Set the whole thing over a high heat and bring to the boil. 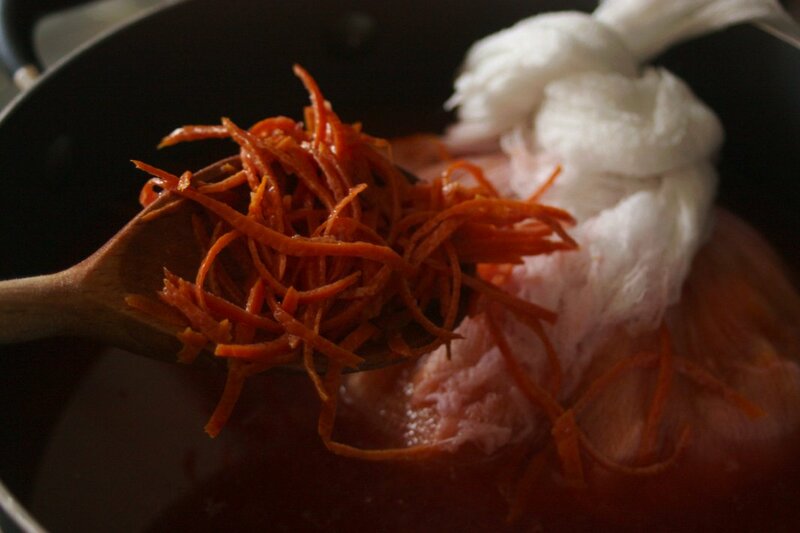 Reduce to a low and steady simmer until the peel is very tender and completely gives when pressed between your fingers, about 35 – 45 minutes. * Around this point, you may want to begin sterilising your jars and lids so they’re completely ready for potting. See here for various methods. I wash the jars and lids, placing the jars upside-down on a tray in a cool oven and letting everything heat up to 120 degrees Celsius (100 fan) for at least 20 minutes, and I put the lids in a small pan with water and let them simmer for at least 10 minutes. I just leave them until I need them. Take the pan off the heat and measure the liquid, carefully straining out and retaining the soft peel and removing the bag of pith and bits. Press and strain any liquid you can from the peel and the bag into the measuring jug; you should have around 1 litre altogether. Either top up the liquid or boil it down as required. Completely dissolve the sugar over a very low heat; there should be no sugar crystals visible on the back of your spoon or spatula if you scrape up the mixture from the bottom of the pan. Bring the mixture up to a strong rolling boil, not bothering to skim any froth which rises. Keep boiling it for 15 – 25 minutes or until the liquid starts to thicken to a syrup and the temperature is at least 105 degrees Celsius. Test for wrinkling at this point if necessary. You can cook it for a little longer if you want a firmer set, but too much turns it into a solid block. Once the marmalade is thick enough, shut off the heat and leave to settle for 15 – 20 minutes so the peel remains suspended in the final marmalade. Gently scoop off any froth which remains. Use this time to prepare for the potting and finish off sterilising your jars and lids. Have your funnel and ladle ready, plus tongs or oven gloves for handling the hot jars. Also, line your work surface with newspaper or tea towels so you don’t shock the jars. Take the hot jars out of the oven and fill them with marmalade, spooning them in a little cautiously to make sure there’s no overflow and that everything is evenly distributed. If using a narrow funnel, you may need to poke in a chopstick or skewer to get the peel through. You’ll feel a little perverted but it’s fine. Leave at least 1 cm headspace between the very rim of the jar and the surface of the marmalade. Wipe rims and screw on the lids right away. Leave the hot jars to cool, undisturbed, until completely set and cold.